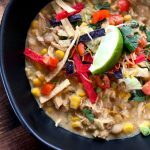 A slow cooked white chicken chili packed with flavor and finished off with creaminess. In a slow cooker add chicken breast, beans, green chiles, corn, spices, and chicken broth. Cover and cook on low for 7-8 hours or high for 5 hours. Remove chicken and shred. Stir back into the chili. Stir in half and half and light cream cheese. Cook on high for 30 minutes. Top with tortilla strips, cheese, green onions, cilantro, tomatoes, and/or a squeeze of lime, if desired. Enjoy!